Sometimes, I think we underestimate the value of having a chore system in place. It doesn’t have to be anything fancy, it just needs to work for your family. I tried several different systems and the most common thing I found in all of them, was that I wasn’t putting forth the effort to make them work. In order for a system to work, we have to work it. A chore system or routine really helps create a smooth running home, but also frees mom up to clean on a deeper level. When my children put their toys and books away from the living room, I am then free to vacuum the floor. Often, it is difficult for me to find the time to do both. Additionally, a system helps put a rhythm to our days. I have come to find at least four valuable concepts learned from having such a system in place. It creates a habit. Using a chore system helps us remember to do certain things everyday. It forms a habit. As we teach our daughters good habits, they will carry them into their adult lives and throughout their marriage. As adults, it is much harder to create those habits. Beginning early can save such time and frustration. It lays a foundation for our daughters to understand how necessary it is be consistent. Creating this habit will also help them know what’s expected of them. If I only assigned chores sporadically, there would be more complaining and resistance because it isn’t the “norm”. This really helps them predict their day. It prevents housework from piling high. This here is a thing of beauty. The more consistent we are with working the system, the less work it really is! As we are keeping on top of the housework by having everyone play a small role, it does not get out of control. Keeping up with things on a daily and weekly basis keeps the workload manageable, and in most cases small. Spending 5-10 minutes per day tidying the bedroom is much easier than spending 2 hours on a Saturday working to reorganize, declutter, and clean up the dirt. Breaking it down into small, manageable tasks helps prevent the housework from getting out of control. It teaches time management. After my children eat breakfast, they put on their chore packs and set to work. I try not to rush them, but I do make them mindful if they are dawdling. I remind them they are cutting into their own free time when they get sidetracked or are simply working as slow as molasses. Each age will differ and with guidance, they will learn to work efficiently. It endorses the value of work. When you finish a set of chores, it’s a good idea to have your daughter look back at what she’s accomplished so she can see the fruit or reward of her labor. After my daughter loads and runs the dishwasher, she understands that because of her efforts, the family will have clean dishes to eat from at dinner time. As we all work together, we look back at how much we’ve achieved and the reward of the work is the satisfied. This is not to puff up with pride, rather it’s an understanding of how useful their hands are and what the fruit of their labor brings. Sometimes they don’t see the “bigger picture” until we point it out. Having a chore system in place is on-the-job training for our daughters. It will set up an excellent foundation for when they go off to manage their own homes. Below I have listed a few resources to help you get your own chore system in place. Remember, find a chore system that works for your family, and work that chore system! Your future son-in-law will thank you! Would you like to receive blog updates to your email? Christin is the wife to a compassionate, God-fearing man, mother & homeschooler of five children (two girls, three boys). She is a woman lost in God. She sees beauty in simple things and appreciates a good cup of coffee. She is learning to live her everydays with joy, find gratitude in the mundane, and speak words of grace. You can find her writing through her days at Joyful Mothering, and tweeting her thoughts on Twitter @ChristinWrites. “Slower than molasses”…that phrase is used a lot in our home, too! I find if I am cleaning along with them it gets done so much quicker. A lot of times they just need a director. I’m happy to play that role! LOL! We’d so much rather do like you said…work a little bit here and there rather than spend a whole entire day cleaning. Great reminders! And when your children are trained, it is so wonderful to be able to trust them to take care of the house when I need to work on something else. We still have to remind them and have them redo some things, but our children can completely clean the house, do the laundry, care for the animals, do the yard work, and cook. So, as a word of encouragement to those of you who have younger children and are in the midst of the training process, all those little steps add up to many miles of progress over the years. I was just working on that with my daughters last week. They are 3 and 4 and I have a hard time getting them to clean up and they make big messes all around the house! So I had my oldest daughter help me write up a clean up chart and break down their clean up into one thing to do at a time and this has really helped my daughters to clean up much nicer! (Just telling them to clean up overwhelms them!) We did a clean up chart for each room that they make messes in: dining room, living room, toy room and bedroom. These are some of the different things I wrote down: pick up all crayons and markers and put back into containers , put books back on book shelf or in the library bin (we keep our library books in a special bin so they don’t get lost), throw scraps of paper away (they love cutting with scissors and making things, but make big messes doing that), put dirty clothes in laundry baskets, toys to the toy room (then the toyroom gets cleaned last after all the other rooms are done and clean up gets broken down for the toy room- everything has a spot. Toy dishes in the toy dishes bin, doll stuff in doll bin, dress up clothes in toy box, misc. toys in toy box, etc.) It is helpful to make the clean up charts when everything is messy- than you can see all the different things that need to get cleaned up in that area! My daughter even had fun helping me create the clean up chart. Now I just need to laminate them so they stay in good condition! Then when clean up is all over if they worked hard, without complaining they get a star for their clean up charts (I just printed a blank 100 chart). We usually do clean up before bed or in the evening as that is when I have the most energy to help them and then we get the house looking nice for the morning. I also found that when my girls clean up- instead of wasting my energy cleaning up after them, I have time to do the more thorough cleaning, which really helps! My mom always told me that children should be assets to the family (they should help make things easier and nicer for the home), not the other way around. And you have to train them accordingly. Yes, children definitely need the leadership and encouragement of their parents in order to “remember” to do their chores and to stay on task. It takes great patience on our part to constantly remind and redirect. The fruition will come later, as I am reminded over and over again by lovely Titus 2 women :). Thank you for that encouragement again. I literally just put together our chore chart this past week for these very same reasons!!! While I was getting it together on the computer, I had a sample for the kids printed out (I was still tweaking it and this was a great way to see what I could improve without laminating it first. Just the final copy printed and laminated and the kids knew what to expect and what was expected of them. I love order and this is order with His grace! We have a routine that we follow with Mommy (me) leading! We do the work together so that it makes for light work and everyone cooperating together. It is a life saver and does teach the children to work hard and diligently and I think that will be something that does affect the way they live the rest of their lives. It’s an honor to be home to teach them this throughout the day. So needful as it also gives our children a sense of belonging in the family as they contribute. It takes time so don’t be discouraged~you moms that have little ones. Keep at it and as they get older, you’ll be amazed at what a blessing it is to you! That’s great Kelly! The routine will be good for the kids and you’d be surprised at how much gets accomplished and how it can free you up to do other things–such as other cleaning, or more play time with your kids, etc. I like this info. We try our best to keep the kids (we have 6) to keep up with chores. They slack off a little bit… ALOT when I am not inspecting as much. They clean as well as I inspect sometimes. I like MANAGERS OF THEIR HOMES book to help. I appreciate people who are very organized. I love love LOVE motivatedmom.com. I recommend it to all and sundry — and my 5YO is constantly asking me for her own. I may mock up a little erasable chart for her with her own chores to cross off. It really does help if you buy a small set of cleaning tools (like dusters and small dustpans/hand brooms for each child – they really take ownership. The fruit is here. My daughter is 16 now and she knows her routines by heart. Her room is her miniature home (as we always call it). She has kept it clean and organized and decorated since she was 11 (thanks to the FLYlady control journal – my daughter made one that works for her). Not only she is able to manage her time wisely with her task at home, she also makes her calendar for school work and activites as well as her free lance photography business (she started her business since she was 15.5). Most importantly, she does every task with a right attitude. I am so thankful that the Lord has graced me wisdom to train her when she was a child. My home still looks “live-in” but we have clean laundry and a clean sink almost all the time. I encourage (not demand) my children to keep their own spaces clean and organized and also assigned them the “common area” hot spots. I am a SHE and I want my children to really see my effort (struggle) in keeping the house clean (with example) by keeping the kitchen sink clear and clean at all time. God meets me where I am at the kitchen – specifically the sink, most of the time. That is why I choose the clean sink task to be my daily default cleaning task.My home still looks “live-in” but we have clean laundry and a clean sink almost all the time. I encourage (not demend) my children to keep their own spaces clean and organized and also assigned them the “common area” hot spots. I am a SHE and I want my children to really see my effort (struggle) in keeping the house clean (with example) by keeping the kitchen sink clear and clean at all time. God meets me where I am at the kitchen – specifically the sink, most of the time. 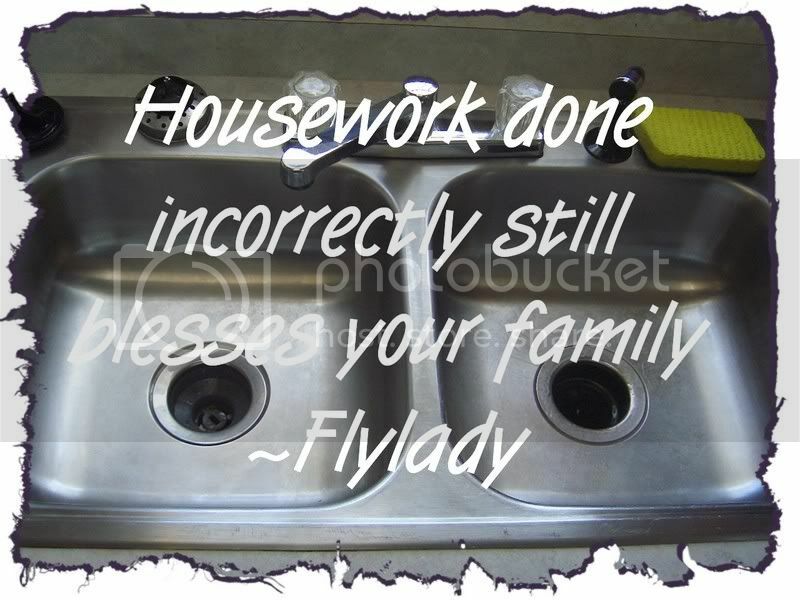 That is why I choose the clean sink task to be my default cleaning task. Previous post: Mix it Up!